Happy Father’s Day to each and every one of you dads out there! You don’t have to dress up each morning in a suit and tie like Bam to be a big deal for your kids. You don’t even have to be bring home the bacon… the little ones will give you a chew no matter what! I hope today will be a very special day for you and your father. Did you have something planned before the big day? Maybe hit a diner for some grub and then a trip out to the lake for fishing? Or perhaps 18 holes of golf (either on the course or on a game console)? Even if you are just going to wing it, make sure to show your dad a good time. And if you can’t be with him in person, find some other way to let him know you care. 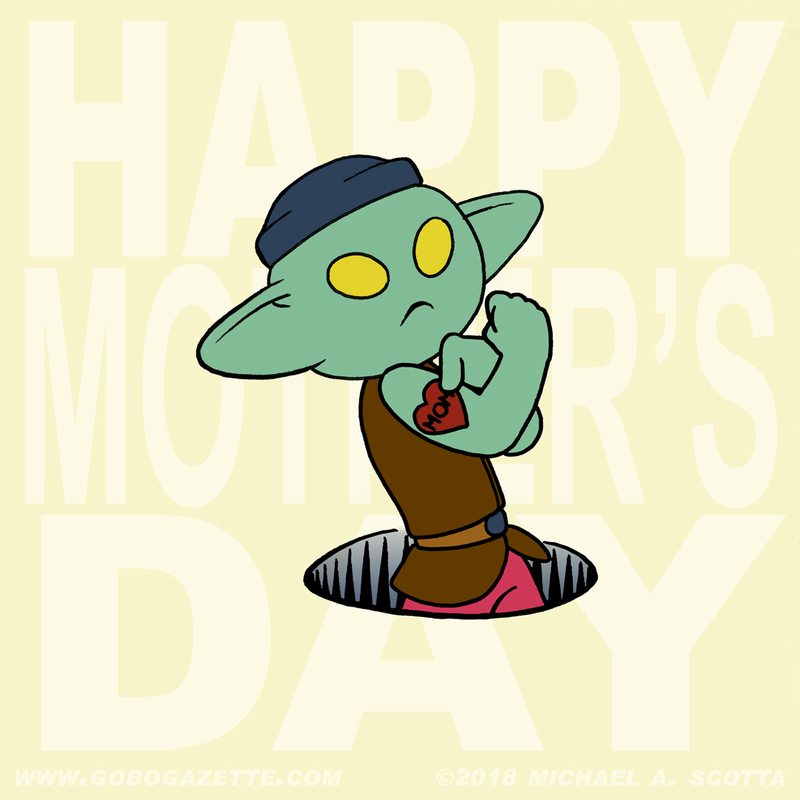 Happy Mother’s Day to all of you tough mothers out there (that’s every single one of you)! Tok is striking a very familiar pose of a cultural icon… can you guess who that icon is before clicking this link? I hope you are doing something special with your mother today. Perhaps you got breakfast ready for her before she woke up today. Or maybe a secret surprise later on that will brighten her day. Better yet, you might have a whole day planned with fun and adventure. At the very least, I hope you have her in your thoughts, especially if you can’t spend time with her. Twelve days have past since the announcement about the series of post on Instagram page, and those days gave us the primary cast members of Gobo Gazette. After “officially” introducing all of the gobos, I have now added the cast page to the menu. Additionally, I have tagged each comic. Now you can see every comic that a gobo – or any cast member – might be in. The cast page is a work in progress as I test the capacity of the data management system. The hope is to not only provide an archive of appearances, but to also provide each character their own page with full image. Plus I will be adding supporting cast to the page as soon as possible. Based on what comics have appeared so far, we should be seeing a handful of new additions soon. 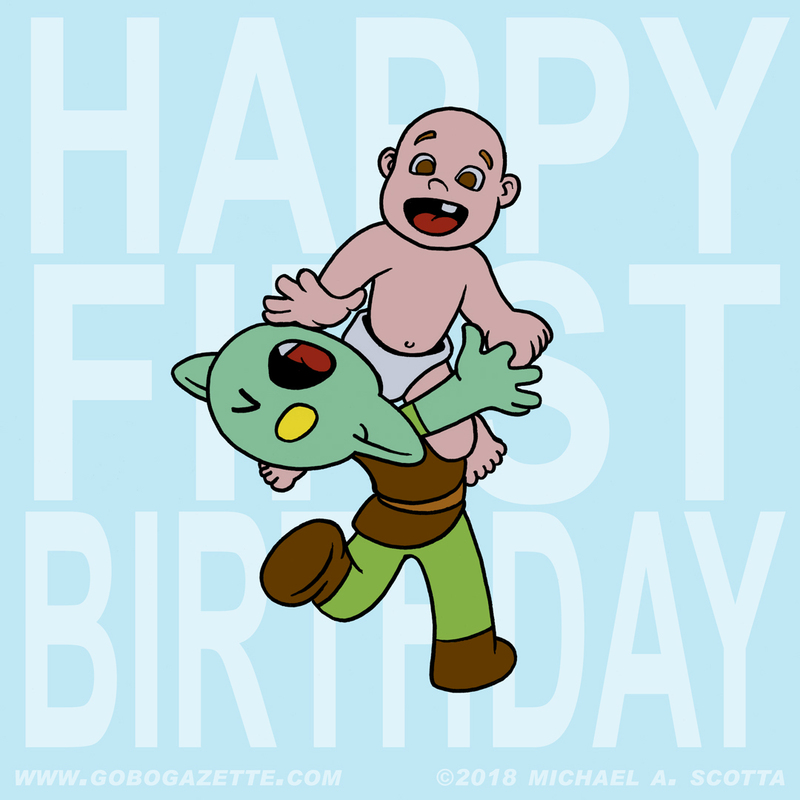 Happy First Birthday, Dante! You’ve definitely changed our lives for the better and are pushing me to be a better person. 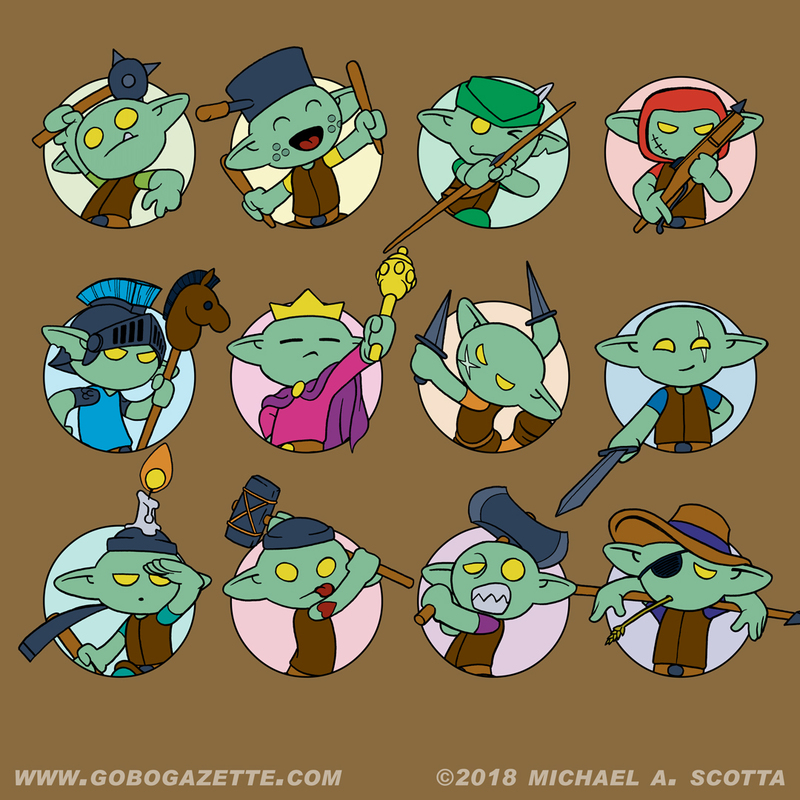 Plus, you’re the inspiration behind the little gobos I draw on this silly webcomic. If you ever met this little guy, you might notice the similarities between him and our twelve little mischief-makers. He might not be green with pointy ears and yellow eyes but he does possess their expressions and penchant for getting into misadventures! Sure he gets into trouble but it is not as crazy as the stuff our little gobos get into. And now some Gobo Gazette news! This is the special tribute I mentioned previously. Starting tomorrow and over the next few days, we will be doing a series of posts on the Gobo Gazette Instagram page. Unlike other posts on that page, we will not be updating the website with each post. Check it out! There will be a big change to the website once it has finished. 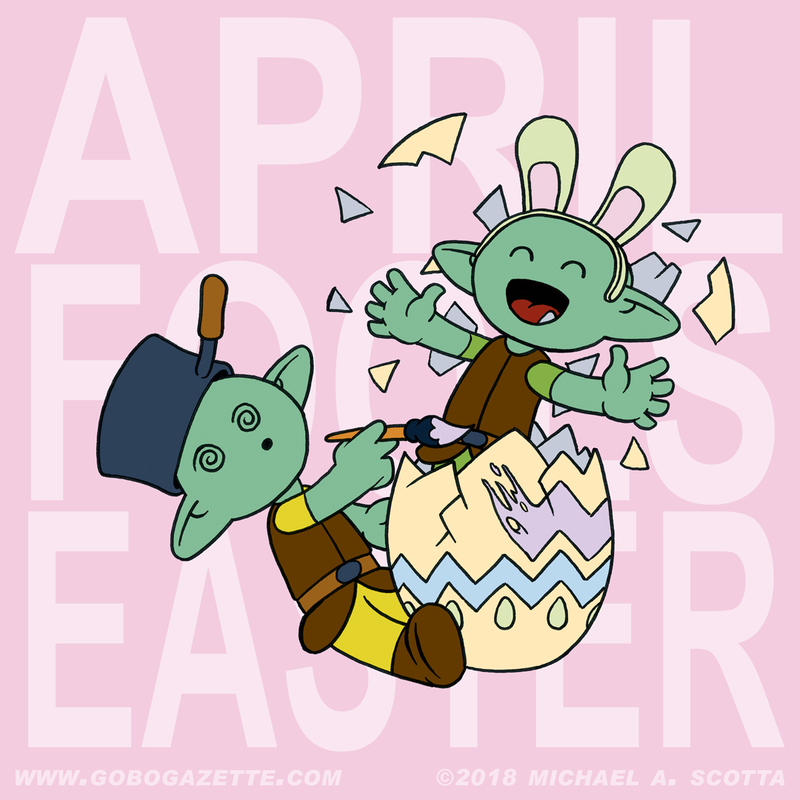 Happy April Fools’ Easter! Is that a thing? We get a two-fer today on our Instagram page, a day of praise and a day of mischief! Well, aren’t they both full of mischief to some degree? Hiding eggs is kind of an impish game, is it not? And what mischief do we have here? It seems like our little spider smasher has been cleverly concealed within an egg which just happened to be selected by our cook for decoration. Surprise! Normally the Instagram page updates at least once a month with non-canon Gobo-centric images. Not for April 2018! Each day we will be posting our comics in order so we can shift the comic there. Just kidding. Actually we have a personal tribute image going up on the 15th and then, each day thereafter, we will be releasing a new image until the month is over. Therefore, you best check it out and then come back in May to see something we have been putting off for a bit.